McMaster PhD student, Scott Laengert is a 2018 recipient of the Vanier Graduate Scholarship. 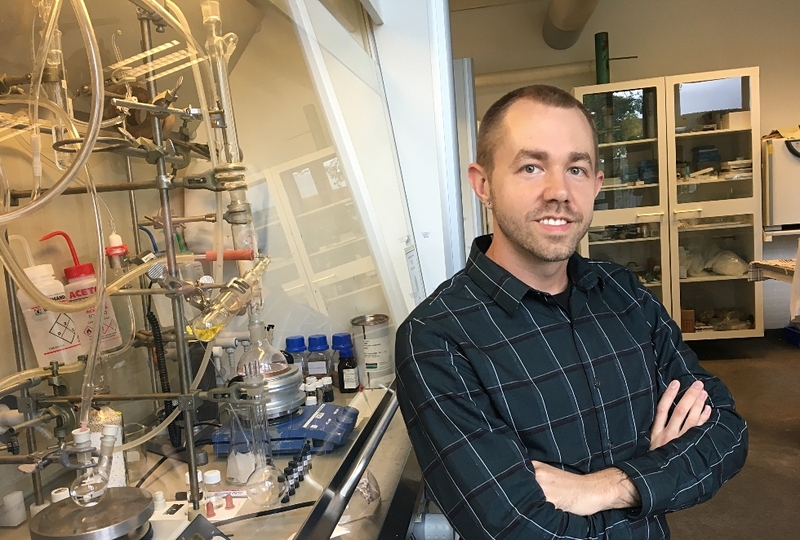 His research is focused on developing new materials that could one day help harness green energy from the world’s oceans. For nine years, Scott Laengert had a successful career as an aircraft maintenance engineer working in western and northern Canada – first in the Yukon and Northwest Territories, then in Vancouver. But he was always drawn to science and, at the age of 28, enrolled at McMaster to begin his undergraduate degree in Chemistry. Now in the second year of his PhD, Laengert is a 2018 recipient of the prestigious Vanier Graduate Scholarship. His research is focused on developing new materials that could one day help harness green energy from the world’s oceans. I grew up in Hamilton, and ended up going to college in North Bay. I wanted adventure so after I finished school, I moved out to Whitehorse, Yukon and started fixing helicopters and worked in that field for 3 or 4 years. I loved the raw nature of the far north, but it was too far from family to stay permanently, so I moved south and started fixing seaplanes in a hangar at Vancouver Airport. It was a steady job with a small crew of really great guys – as a young person trying to make it in that industry, it was pretty much everything I could ask for. But I still felt restless, and after a few years, it became clear to me that I wanted a career in science. Ever since I was a kid I’ve always been endlessly fascinated by science. Not just chemistry but astronomy, biology, physics, the whole thing – I love it. I think coming back to school a bit later in life was for the best because I may not have taken it as seriously at 18 – I didn’t know I would be so passionate about it then because I didn’t have much else to compare it to. Now that I’ve been out there and explored other interests, I’ve realized what I like most in life. The connection to science just really clicked. I work primarily with silicone polymers, which as a class of materials, have an expansive range of applications due to their really unique chemical and physical properties; from sealants and adhesives to biomedical implants. Silicones are completely synthetic materials with a good environmental profile. However, a lot of energy is required to make them. My research involves taking natural plant materials, such as the precursors of wood (lignin), and chemically incorporating them into silicones used in what are called “electroactive polymers” – devices that have the proven potential to harvest wave energy from the ocean and interestingly, could also be used to create synthetic muscles. Since these silicones are diluted with natural materials, they should have a smaller environmental footprint. Also, this work should lead to the creation of new silicone materials with interesting new properties. I really like that silicone chemistry is an interdisciplinary field of study, and so it involves a pretty wide set of skills. I’m able to work in organic synthesis one day, and the next day use those products to fabricate materials that have never been tested before. It’s especially important to me that reducing the environmental impact of these materials is one of my main goals. I’m also lucky to work with a group of colleagues who bring a lot of drive and creative energy to the lab – this aspect of community is a big part of what makes this work so enjoyable. When I was a teenager, I spent seven years in the Air Cadet program, learning a lot about leadership and teamwork. Over the past three years, I’ve rejoined the squadron and become a civilian instructor. Now I’m there every Monday night teaching classes in aviation and aerospace, citizenship, and many other topics. I’m looking for ways I can improve the program and also make people’s experiences there more fun. Many of the subjects I teach are related to some form of science, and I like to encourage these kids to ask lots of questions about how things connect beyond just Air Cadets – to think about the bigger picture and ask how they can better themselves and their communities. Along the way I’m growing as an instructor and giving back to an organization that was fundamental in shaping the person I am today. In science there’s a lot of problem solving and it’s always something new. So often, you hit a dead end and you’re like, “ok, what now?” It’s finding that new angle, some different way of approaching it, that’s what I love the most. Being physically active every day is essential for a heathy mind. I like to climb – indoor rock-climbing mostly – because I find it to be highly meditative. When I’m half-way up the wall, looking for the next hold, I’m not thinking about work, relationships, or anything else except how can I make contact with that next hold – it’s very therapeutic. The Vanier Canada Graduate Scholarships are the Government of Canada’s most prestigious awards for doctoral students. The program provides $50,000 per year for up to three years to students who demonstrate academic excellence, research potential and leadership ability. Up to 166 awards are distributed each year by three federal granting agencies: the Canadian Institutes of Health Research (CIHR), the Natural Sciences and Engineering Research Council (NSERC) and the Social Sciences and Humanities Research Council (SSHRC). This year, 10 McMaster students received Vanier scholarships.